This page describes the second step of creating a synchronize task with the New Task Wizard. 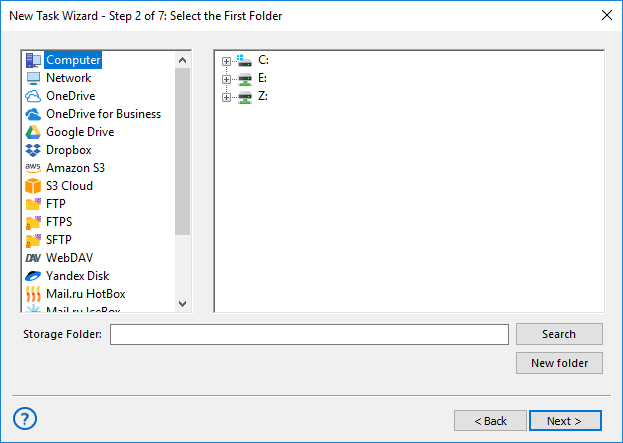 On the second step of the New Task Wizard, you need to select a first folder for synchronization. The window consists of two panes: Data Source and Folder Selection. In the Data Source pane, you can see different types of storage file systems that may contain a folder you want to synchronize. In the Folder Selection pane, you can see folders available in the selected source. (Server edition only) At the top left corner of the window, select Workstation that contains the folder that you want to synchronize. In the left pane (Data Sources), select a source of data. For example, if you want to synchronize a network folder, select Network. In the right pane (Folder Selection), select a folder you want to synchronize. Don’t worry about direction of synchronization: it is set in the next steps.